Kontron have introduced the Kontron CP308, a high-performance 3U CompactPCI CPU board equipped with the 45nm Intel Core 2 Duo processor, Intel GS45 graphics and memory controller hub and Intel I/O controller hub ICH9M. The scalable Kontron CP308 with 45nm technology, available from Dedicated Systems Australia , excels over 65nm designs with up to 50% more L2 cache (6MB) and a 60% faster FSB (1066MHz) with similar or lower energy consumption. The Kontron CP308 offers scalable 45nm CPU performance to suit the individual requirements of a wide range of applications that demand energy efficient dual-core performance such as, image and video processing as well as robotic and other real-time applications. The Kontron CP308’s performance ranges from the high-end 2.26GHz version with 1066 MHz FSB for compute intensive solutions and the low power 1.86GHz version with 1066MHz FSB for energy sensitive applications to the ultra low power 1.2GHz version with 800MHz FSB for applications where power dissipation is critical. 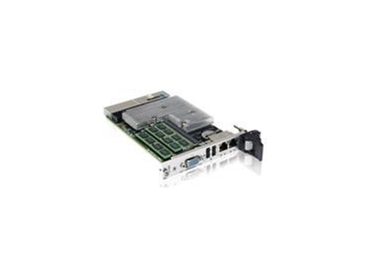 The Kontron CP308 3U CompactPCI CPU board features up to 8GB of energy efficient DDR3-SODIMM RAM with 800/1066 MHz memory bus and offers a rich feature set: a VGA port, up to seven USB 2.0 ports, two COM ports, two Gigabit Ethernet ports and four SATA interfaces, which are available either on onboard connectors, front I/O or rear I/O connectors. Additionally, one USB port is reserved on a dedicated onboard connector for mounting an appropriate USB NAND Flash module. To assure the highest data and system security, the chipset-integrated Trusted Platform Module (TPM) offers the required encryption, verification and storage capabilities for security-sensitive applications. The Kontron CP308-HDD offers even more features such as, the 8HP version of the Kontron CP308 extends the interfaces on the front panel by 1x DVI, 1x COM port, 1x PS2, 2x USB 2.0 and adds a reset button. For data storage, the Kontron CP308-HDD offers support for a 2.5” SATA hard drive and a USB NAND Flash module and offers an onboard Compact Flash socket, all the three can be used simultaneously. On the system side, the Kontron CP308 provides a PCI 32-bit, 33MHz CompactPCI interface supporting the drone mode feature. When installed in a system master slot, the CompactPCI interface works in transparent mode, whereas the interface is isolated when installed in a peripheral slot. The Kontron CP308 supports the Wake on LAN (WoL) function and has a 32-Bit micrcontroller onboard to take over system management tasks.The Kontron CP308 runs with Linux, VxWorks, Microsoft Windows XP, Vista, XP embedded or Windows Server 2003. Highly integrated board support packages support all onboard hardware devices.